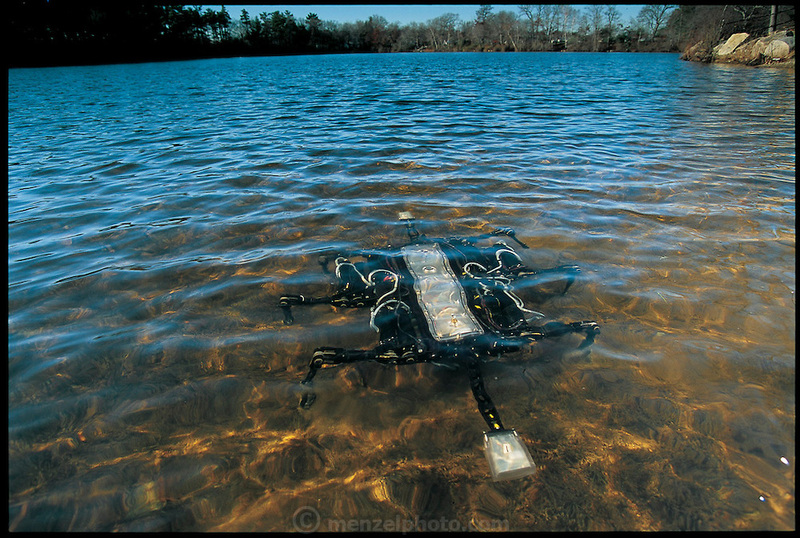 Just below the surface of a reservoir outside Boston, MA, robot Ariel, built by the Massachusetts firm iRobot, walks sideways like the crab it is patterned on. A machine with a serious purpose, it is designed to scuttle from the shore through the surf to search for mines on the ocean floor. Ariel was funded by the Defense Advanced Research Projects Agency and built by iRobot, a company founded by MIT robot guru Rodney Brooks. Inspired by research on crabs at Robert Full's lab at Berkeley, Ariel takes advantage of the animal's stability and improves on it. From the book Robo sapiens: Evolution of a New Species, page 84-85.